You Are The Roots: so, you want to tot school? I am frequently asked about Tot School and the biggest question I get is how: how? How to get started? 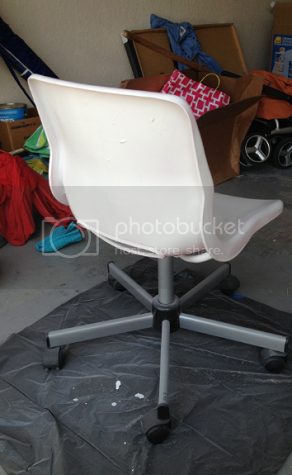 How to set up your space? I was asked twice very recently and figured instead of typing up two separate, lengthy e-mails, I would simply pack all of the information into a post to share. 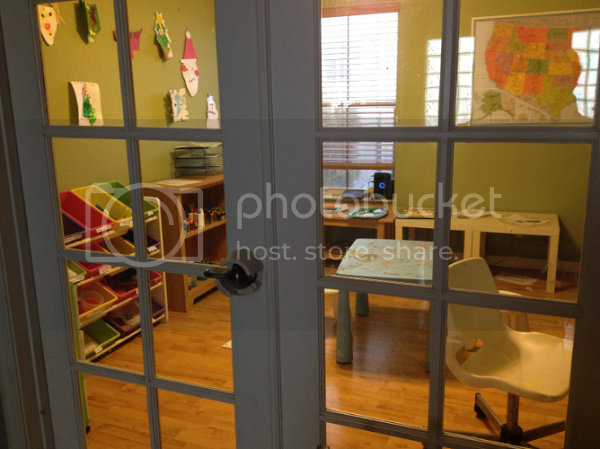 We happen to have a home office that we devote to solely being our tot school classroom. Even if you don't have a separate room to completely devote to tot school, pick a space, even if it's the left side of the dining room table. The first couple of weeks of sinking into our routine were the roughest as far as convincing him that a room once known to be one thing is now known to be something else. Having a designated "tot school place" helps make the transition into tot schooling easier, even if it's just a certain place at a table. This past December, we moved Ethan's tot school classroom from a spare bedroom to our home office and even so, it took a couple of weeks for Ethan to truly accept this change and the new room as his tot school space. Toddlers can be sticklers for routine and don't typically react very well to change so picking a designated space and keeping with it is a definitely must for growing into a tot school routine. 2. Storage is your friend. This was the biggest piece of advice I received when starting tot school and I cannot stress how valuable this advice was. You accumulate a lot of stuff doing tot school and the last thing you want is to toss out an old activity, realize six months later you need some of the pieces and have to go out and buy the supplies all over again. We picked up these storage bins from someone selling them for $15 on a local moms group and the wooden shelf from Goodwill for $8.00. Even if it's just spare room in a linen closet, you're going to want some organized storage space. 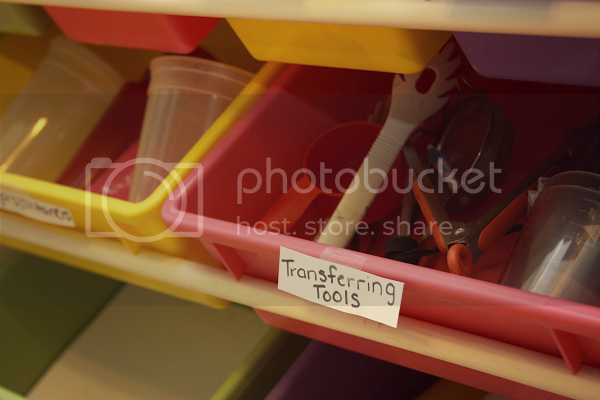 Our storage bins contain a lot of things that we reuse frequently in tot school: clear page protectors, transferring tools (tongs, tweezers, scoops, etc. 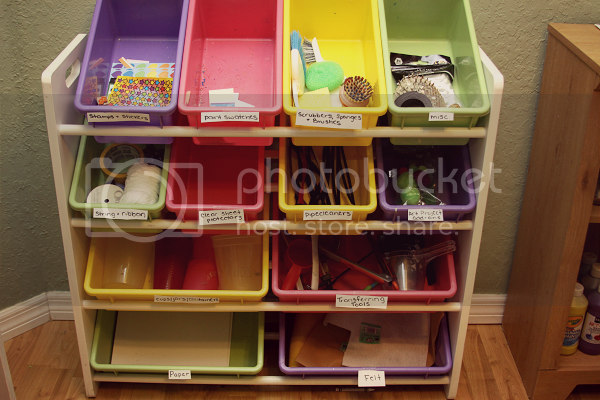 ), cups and bins, paint swatches and just about any other odd and end (there's definitely a miscellaneous bin filled with everything from beads to toy animal figurines to popsicle sticks). My favorite thing to do is take trips to Deals (my favorite dollar store!) 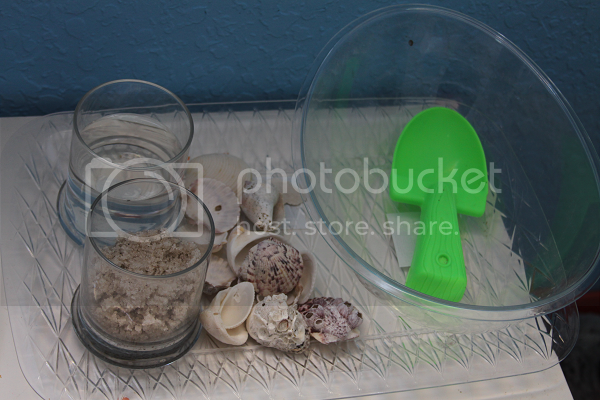 and collect trinkets that could be valuable in upcoming tot school lessons. 3. Stop spending money. Tot school doesn't have to be expensive. Ethan's table and chairs came from Ikea and everything else has been from Goodwill or something someone has gotten rid of. I like to recycle a lot of materials to use in his activities (old boxes, empty milk containers and jugs, egg cartons, those plastic take-out soup containers, yogurt cups, empty toilet paper rolls, etc.) so I'm rarely buying anything new. There were a few things that I did purchase at a local educational store (paints, dry erase pouches, art hanging wall clips) and a few things I stocked up on at Wal-Mart before beginning (rolls of magnet tape, glue, Do-A-Dot markers) but for the most part, everything I pick up comes from the dollar store or Goodwill. By reusing our materials in subsequent weeks, it's easy to keep the price down and not spend an extra cent on tot school during any given month if I don't have to. Sometimes I do set out for something specific, but I never spend more than $10 per week on the weeks I do need something I don't already have. All of our trays for our tot trays come from Deals where they are a dollar a piece so I'm not too picky about color. 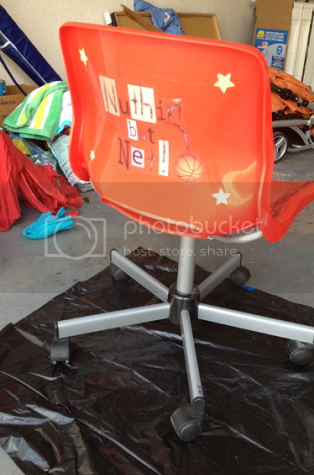 I mean, it's amazing what a Goodwill score and a can of spray paint can accomplish. 4. Ask questions. Lots of 'em. When I made the decision to start tot school when Ethan was just over a year old, I think I bombarded Nicole with questions every hour on the hour. I was apologetic, but she was very eager to answer me and help me out as best as she could. Now that we've been a "tot school family" as long as we have, I definitely get her eagerness to help. I love talking tot school. I could geek out about tot school for hours if someone gave me the opportunity, so I appreciate when people do choose to ask me for help. Tot school is probably one of my favorite things to talk about and I would love to help people get started or get the ball rolling for their own curriculum. 5. "But where do you get your ideas from?" I like to keep our tot school curriculum play based. Ethan thinks his tot trays are a blast and I love making learning fun for him. I also like to keep his imagination going by including open-ended trays or, more recently, trays which encourage discussion about ideas or experiences. I think that if you're going to teach your child to use their imagination, you also have to use yours -- so I keep that in the back of my head when trying to come up with tot school curriculum. I like to jot down my ideas if I ever have them sporadically, but I also like to give myself one day of the week to brainstorm and create our upcoming curriculum (this is usually Sunday for me). Once you get a couple of weeks under your belt, it all starts to feel more natural than it does in the beginning. The more you continue on, you will see what your child needs extra help with -- letter recognition, fine motor, gross motor, cutting, whatever it may be -- and can continue implementing more of those activities in future weeks. 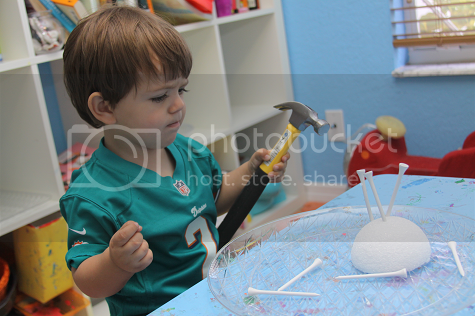 For a while, Ethan had a very tricky time with tweezers and tongs. I tried to keep at least one tweezer or tong tray in our repertoire over the next few weeks until he mastered the skill. Some things are trial and error. Sometimes you think of a fabulous idea and put all of this effort into the tray only for your child to snub it and refuse to do it -- and that's okay. Sometimes when this happens I put the tray away and pull it back out in a couple of weeks. Other times I accept that it's just not something my kid is into (like felt -- Ethan despises felt!). There are also several great tot school resources if you need some help with a specific theme or idea or are just feeling a little blocked creatively. 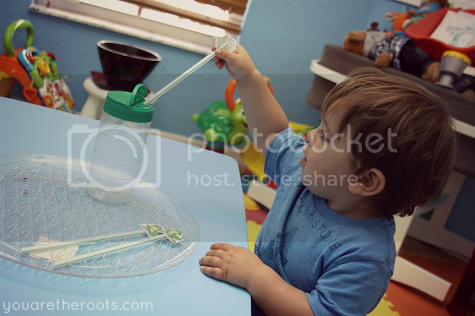 Pinterest is always a great place to check out tot school activities or tot trays. Even if you're not a blogger, sharing photos of your own ideas on Pinterest could be a great resource for others, too! 1+1+1=1 is also a great resource for tot school parents. Every Sunday she also features a link-up where other families can share their ideas, too! If you aren't too "computer savvy" and find yourself struggling with making original printables, there are plenty of websites that offer free printables. My favorite is Twisty Noodle! 6. "When should I do tot school?" Ethan is in charge of when he feels like doing tot school. Most weeks, it's any moment of the day that we are at home. Some days he will wake up, ask to do tot school and we repeat the tot trays for hours. Some days, he just won't feel like doing a lot of the trays. 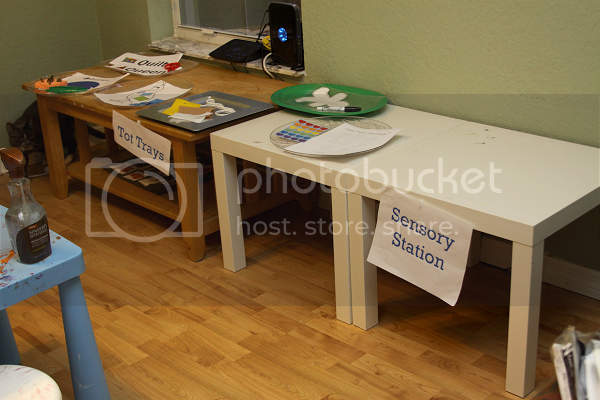 I like to make our tot school classroom a child-led environment and it's worked very well for us. There is rarely a day that goes by when Ethan opts out of tot school because it is just something that he loves so much. By not setting a set time to do tot school, it gives Ethan the confidence of being in charge of his own learning experience and keeps our days running smoothly so we can fit in all of the other fun activities that Ethan gets to participate in regularly (like My Gym, trips to the museum, play dates and the like). Like most toddlers (I hope), Ethan can have his fair share of moods and it's always best to not push him to do tot school when he's just not feeling up to it. The same goes for weeks when he tries a tray and doesn't want to finish -- he doesn't have to. 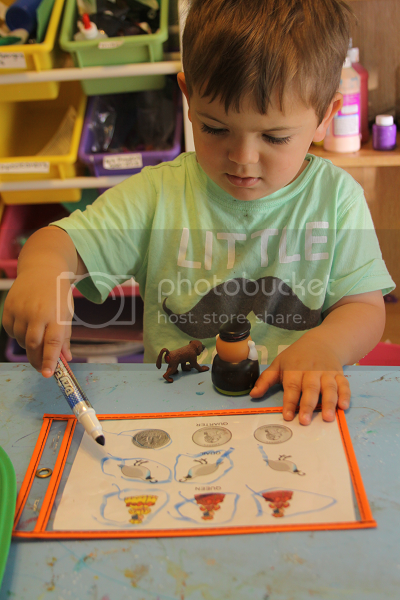 Ethan cherishes his tot school space and is always so eager and excited to learn and play. His tot school space is his space and his tot school time is his time, and it has worked very well for us. There is little in life Ethan loves more than tot school! 7. "How do I know what themes to do?" Because you're the teacher and you get to come up with the lesson plans, that's how! When Ethan was an infant, we started with colors. 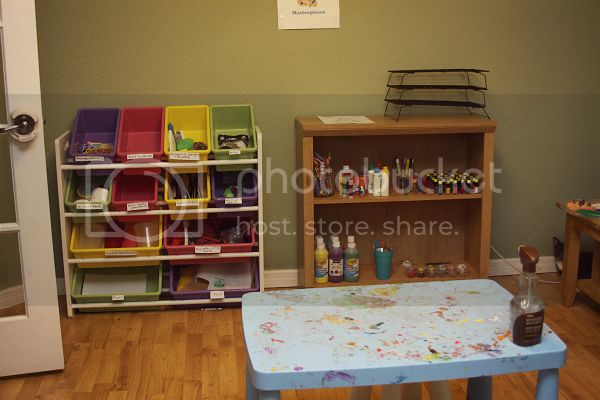 Our entire tot school set-up is way different than it was when we first began (infant tot school room seen here), just due to Ethan's development. After doing one color per week, we moved on to letters -- interjecting every once in a while with specific themes (our toddler geography unit is still one of my favorites). I like to keep incorporating certain factors (fine motor, practical life, etc.) into each weekly theme so I just plan accordingly. I like to have 5 or 6 tot trays set up per week plus either a magnet board (made on an old cookie sheet), hands-on activity (like baking) or a sensory bin. There is no right way or wrong way to do tot school and I'm hard pressed to find any negative in starting. On my list of goals is to start a tot school co-op within the next year or so, which I'm pretty excited! As I keep mentioning, Ethan and I both cherish our tot school time very much. It has been a wonderful bonding experience on top of everything else and, with such a dedicated play-based learning curriculum, we've had such a blast doing it. I hope this guide helps you in your decision to begin tot school and, as I mentioned previously, I'm here to answer any questions you might have!